1دانشیار گروه اقتصادکشاورزی، دانشکده کشاورزی، دانشگاه فردوسی مشهد. 2دانشجوی دکتری، گروه اقتصادکشاورزی، دانشکده کشاورزی، دانشگاه فردوسی مشهد. بسته­بندی به عنوان یک ابزار برای شناخت و تمایز محصول نقش بسیار مهمی در تصمیم خرید مصرف­کنندگان ایفا می­نماید و از آن می­توان برای ایجاد مزیت رقابتی استفاده نمود. زعفران یکی از محصولات مهم کشاورزی است که بسته­بندی مطابق با تقاضای مصرف­کنندگان موجب افزایش فروش و رضایت­مندی خریداران می­گردد. لذا هدف اصلی این مطالعه رتبه­بندی عوامل مؤثر بر بسته­بندی از دید مصرف­کنندگان زعفران در شهر مشهد می­باشد. اطلاعات این پژوهش، در قالب 99 پرسشنامه که در سال 1394 از سوی مصرف­کنندگان زعفران شهر مشهد پاسخ داده شده، جمع‌آوری شده است. برای رتبه­بندی عوامل مؤثر بر بسته­بندی این محصول، از روش تحلیل سلسله مراتبی استفاده شده است. نتایج مطالعه نشان داد که ارائه اطلاعات مربوط به مواد مغذی زعفران و درج استانداردهای داخلی و بین­المللی، بر ترجیحات مصرف­کنندگان بیشترین تأثیر را دارند. همچنین، نتایج رتبه­بندی گزینه­ها نیز نشان داد که راهبرد توجه به نام تجاری درج شده روی بسته­بندی از نظر مصرف­کنندگان دارای بیشترین اهمیت است. لذا، درج عناصر اطلاعاتی روی بسته­بندی می­تواند شیوه مناسبی برای تمایز نام تجاری و افزایش ارزش آن باشد. با توجه به نتایج مطالعه، به تولیدکنندگان و عرضه­کنندگان زعفران پیشنهاد می­گردد که در طراحی بسته­بندی به ویژگی­ها و عناصر اطلاعاتی بیشترین توجه را داشته باشند. Packaging is a tool for recognition and differentiation of product and it plays a crucial role in consumers' purchasing decisions, and it can be used to create competitive advantages. Saffron is one of the most important agricultural crops in Iran and its packaging in accordance with consumer demand increases sales and satisfaction of the consumers. Therefore, the main objective of this study is to rank the factors affecting the packaging from the perspective of consumers of saffron in Mashhad. Data was collected in the form of 99 questionnaires that have been answered by the consumers of saffron in Mashhad in 2015. Analytic hierarchy process (AHP) was used to rank these factors. The results showed that labeling information about internal and international standards and saffron nutrients on the package have the greatest impact on consumer preferences. Also, the results of the ranking alternatives indicated that attention to the brand labelled on the packing is the most important issue from the perspective of the consumers. Hence, labelling information elements on the package can be a good way for brand differentiation and increasing its value. According to the results, it is recommended that producers and suppliers of saffron pay more attention to features and information elements in package design. Aday, M.S., and Yener, U. 2014. Understanding the buying behaviour of young consumers regarding packaging attributes and labels. International Journal of Consumer Studies 38 (4): 385-393. Al-Harbi, K.M.A.S. 2001. Application of the AHP in project management. International Journal of Project Management 19 (1): 19-27. Ampuero, O., and Vila, N. 2006. Consumer perceptions of product packaging. Journal of Consumer Marketing 23 (2): 100-112. Cameron, K., Beare, M., McLaren, R., and Di, H. 1998. Selecting physical, chemical, and biological indicators of soil quality for degraded or polluted soils. In Proceedings of World Congress of Soil Science 16. Ebadzadeh, H.R. 2015. Agricultural statistics: Ministry of Jihad Agriculture. Eldesouky, A., Pulido, A.F., and Mesias, F.J. 2015. The Role of Packaging and Presentation Format in Consumers’ Preferences for Food: An Application of Projective Techniques. Journal of Sensory Studies 30 (5): 360-369. Fernqvist, F., Olsson, A., and Spendrup, S. 2015. What’s in it for me? Food packaging and consumer responses, a focus group study. British Food Journal 117 (3): 1122-1135. Gadioli, I.L., Pineli, L.D.L.D.O., Rodrigues, J.D.S. Q., Campos, A.B., Gerolim, I.Q., and Chiarello, M.D. 2013. Evaluation of packing attributes of orange juice on consumers' intention to purchase by conjoint analysis and consumer attitudes expectation. Journal of Sensory Studies 28 (1): 57-65. Ghodosi, M., Mohtashami, T., Motavalli, M., and Sheddati, Sh. 2016. Identification and prioritization of marketing mix elements affecting the export of saffron from the perspective of exports. 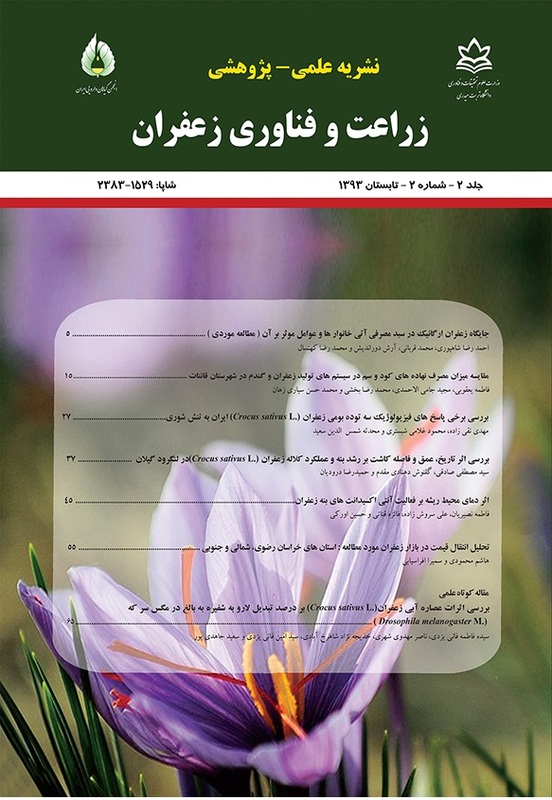 Journal of Saffron Agronomy and Technology 3 (4): 285-296. (In Persian). Gomez, M., Martin‐Consuegra, D., and Molina, A. 2015. The importance of packaging in purchase and usage behaviour. International Journal of Consumer Studies 39 (3): 203-211. Koutsimanis, G., Getter, K., Behe, B., Harte, J., and Almenar, E. 2012. Influences of packaging attributes on consumer purchase decisions for fresh produce. Appetite 59 (2): 270-280. Mohammadian, F., Shahnoushi, N., Ghorbani, M., and Aghel, H. 2009. Select potential crop pattern based on AHP model (case study: plain Torbatejam). Journal of Sustainable Agriculture 1 (19): 169-187. (In Persian). Momeni, M., and Sharifi Salim, A. 2011. MADM Models and Softwares (AHP, ANP, TOPSIS and PROMETHEE). Publisher Authors, Tehran, 218pp. (In Persian). Nasrollahzadeh, A., Jafari, S.M., and Akbari, E. 2014. Survey of challenges and problems of packaging Saffron. Iranian Journal of Science and Technology Packaging 5 (20):18-29. (In Persian). Pezeshkirad, Gh., and Feali, S. 2010. Challenges and solutions for the processing, marketing and export of saffron: application of Delphi method. Agricultural Economics 4 (1): 137-157. (In Persian). Pohekar, S.D., and Ramachandran, M. 2004. Application of multi-criteria decision making to sustainable energy planning-a review. Renewable and Sustainable Energy Reviews 8 (4): 365-381. Saaty T.L. 2005. Theory and Applications of the Analytic Network Process: Decision Making with Benefits, Opportunities, Costs, and Risks. RWS publications. Saaty, T.L. 1996. Decision making with dependence and feedback: The analytic network process. RWS Publications, Pittsburg, USA. Saaty, T.L. 2008. Decision making with the analytic hierarchy process. International Journal of Services Sciences 1 (1): 83-98. Saaty, T.L., and Vargas, L.G. 1987. Uncertainty and rank order in the analytic hierarchy process. European Journal of Operational Research 32 (1): 107-117. Shahin, A., and Kalij, Y. 2009. Evaluation of distributors by analytical hierarchy process-The case of Paak dairy company. Iranian Journal of Engineering Education 10 (40): 151-171. (In Persian). Silayoi, P., and Speece, M. 2004. Packaging and purchase decisions: An exploratory study on the impact of involvement level and time pressure. British food journal 106 (8): 607-628. Silayoi, P., and Speece, M. 2007. The importance of packaging attributes: a conjoint analysis approach. European Journal of Marketing 41 (11/12): 1495-1517. Wang, E. 2013. The influence of visual packaging design on perceived food product quality, value, and brand preference. International Journal of Retail and Distribution Management 41 (10): 805-816. Westerman, S.J., Sutherland, E.J., Gardner, P.H., Baig, N., Critchley, C., Hickey, C., Mehigan, S., Solway, A., and Zervos, Z. 2013. The design of consumer packaging: Effects of manipulations of shape, orientation, and alignment of graphical forms on consumers’ assessments. Food Quality and Preference 27 (1): 8-17.